I’m sorry to tell you, but everything you know about Dungeons & Dragons is a lie. There are only eight alignments. 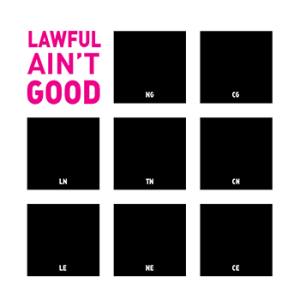 Because like the title of this essay suggests, Lawful ain’t Good. I can already hear you protesting. The Law/Chaos axis is wholly separate from the Good/Evil axis, you’ll argue. It’s not. Lawful is incompatible with Good. To understand the alignments, I’ll be using the rather interesting in-depth analysis found in the anonymous essay “The Nine Alignments” as my starting point for this argument. As that essay (and I) understand it, Law is the creation, advocacy, and/or maintenance of rigid moral structures that lay out codified, you know, laws. Chaos is ignoring or fighting against codified moral structures. Neutrality is not being particularly partisan to either side of this. Good is pro-social behavior, like helping people at some real cost to yourself, forgiving people, working to alleviate suffering, acting altruistically, etc. Evil is antisocial behavior, like unwarranted aggression, infringing on others’ liberty, torture, sexual assault, genocide, cruelty, causing deprivation, and the like. To be Neutral on this axis is to be Good and Evil in some semblance of balance. My argument is that, to be Good, one cannot also be solely Lawful. In fact, to be actively Lawful is inherently Neutral or Evil. To be Lawful is to be righteously moralistic, because a Lawful person believes that it is possible to create systems of laws that are just. A system of law takes one person’s or group of people’s ethics and imposes it upon others, predetermining what is considered justifiable or unjustifiable behavior. On some level, we all know that law is bad. Culturally, it’s considered a necessary evil. We celebrate tales of beggar thieves who steal bread, of bandits who steal from the rich and give to the poor. I would argue that Law, this “necessary” Evil, isn’t necessary and it certainly isn’t Good. Chaos, on the other hand, suggests an organic system of ethics, in which situations are handled, well, situationally. Chaotic individuals deal with issues as they arise and mete out justice themselves when necessary but are far, far more likely to simply adopt a live-and-let-live attitude. It’s only through Law that systemic violence can be created. Law has, built into it, a greater ability to create Evil than Chaos does. Chaos only allows for distributed, or individual, acts of oppression. Social justice, a study and practice devoted to understanding and undermining oppression faced by various people in the world today, has made an excellent argument that systemic violence (that is, violence that is perpetuated by an entire social system) is generally more oppressive than what I’ll call distributed violence, which is to say individual acts of violence. When there’s an entire system in place to keep you oppressed, the ramifications of each individual act against you is essentially magnified by the power of that system. This is why, in the USA, discrimination against white individuals on the basis of their skin is frankly not as much the anti-racist priority as discrimination against non-white individuals on the basis of their skin—there’s an entire system and history of oppression against people of color. And the only way you can create systems of oppression is through law and the moralism it entails. The governmental system that “fights for justice” today is the same one that had legalized slavery and has dictated whom we can love, what imaginary borders we can cross, which drugs are acceptable, and even what we can wear. At this point, the partisan of Lawful Good—or even someone who is just annoyed that I’m trying to claim Lawful ain’t Good—will argue that these are examples of Evil perpetuated by Law. These examples are clearly in the realm of Lawful Evil—or perhaps Lawful Neutral. In fact, such a partisan could argue, one could make the same strawman arguments about Chaotic Evil behaviors and apply them to everyone on the Chaotic end of the Law/Chaos axis. And that’s fair. And the very act of creating and enforcing a moral system into which you expect others to conform is Neutral at best and Evil at worse. It presupposes that people are not capable of being Good without being forced into that behavior, and it forces people into one person’s or group’s ideal of Good without allowing for variance. Forcing others into a system of beliefs is not Good behavior as we understand it. Any hierarchy leaves responsibility at its pinnacle. A legal system, by claiming dominance over an entire culture, is therefore responsible for the whole of that culture, including its positive and negative qualities alike. Since no law can ever be Good all the time, a system based on laws can never be purely Good. Chaotic folks, on the other hand, make no claims over the actions or ethics of others and are not responsible for how others behave. A chaotic society can include both Good and Evil in equal measure, but the advocate of Chaotic Good is not responsible for the actions of those who remain Chaotic Evil—although they would certainly work to eradicate that Evil. At the risk of invoking Godwin’s Law (heh), some of the exemplars of Lawful Evil behavior are Hitler and Stalin. Both created incredibly Lawful societies that perpetuated incredible Evil. But who are our paragons of Lawful Good? Abraham Lincoln? Lincoln oversaw the largest mass hanging in US history, which was of Native Americans defending their territory against US intrusion. The emancipation proclamation he signed only freed the slaves in the rebel states, not those (more than a million) living in the loyal states. Freeing slaves is a Good act, but invading and murdering the indigenous people of this land was an Evil one. Abraham Lincoln was probably Lawful Neutral, by our understandings, at best. Every potential example of Lawful Good from history I can imagine was either, on further analysis, not Lawful or not Good. The closest I will allow are those aspirants to Lawful Good who died before the won, before the Law they promoted became just another set of chains to shackle humanity. These are people who have convinced themselves they are Lawful Good. But anyone who seeks to chain the rest of us is not Good. It’s possible to do Good through the law. Those who do so are Neutral Good, using law as a tool when necessary for the greater Good. But at their extremes, Law and Good are fundamentally incompatible, incapable of overlap. Chaos and Good are compatible: one can believe with all one’s heart in Good and fight against Law. Chaos and Evil are compatible: one can fight against every fetter while still being antisocial and cruel. Law and Evil are compatible: ask any politician who serves a system that enslaves people, tortures people, denies whole segments of society agency, imprisons drug users, turns a blind eye to police violence, colonizes previously-settled terrain, or wantonly destroys the earth—which is to say, the politician of more or less any existent or historical government. I’m far too much a partisan of Chaotic Good to advocate that it’s the best alignment by which to live your life. I work against Evil and I work against Law, and I find the overlap of those two to be the most egregious—and common—ill in this world. But others don’t, and I have no strong desire to convince them otherwise. The world is quite interesting the way it is, full of diverse people who act, consciously or not, by these various alignments—all eight of them. This essay and The Nine Alignments are available in a zine from Strangers In A Tangled Wilderness. In short – you’re saying that because you do not believe that Lawful Good is possible in our world, that it cannot be possible in a fantasy universe with flying, fire breathing dragons, lightning bolt and resurrection spells, Beholders in space ships, and 10 000+ other impossible things? It’s another part of the fantasy. I prefer the law of chaos to the chaos of law, but nonetheless, I don’t think the D & D rules will change anytime soon. As a chaotic-good person, I can easily agree that law, as in human government, is contradictory to good, but a lawful-good identified person would conclude the opposite. And an evil philosopher, ie, Ayn Rand, will say that what we call good, such as altruism, is actually evil. Why is there a two-dimensional alignment system? When Dungeons and Dragons started in 1974, there was only lawful, chaotic, and neutral. This was directly adapted from Michael Moorcock’s Elric series. Two supernatural legions, Law and Chaos, eternally vied for dominion of the universe. In superficial ways, these forces roughly corresponded with traditional ideas of good and evil; the gods of law were handsome and Apollonian, and the lords or chaos were demonic, thirsty for your life-force. But Moorcock is an anarchist, delighted to turn this trope on its head. His hero Elric is raised in the religion of Chaos. Vain and ruthless, he is also passionate and sympathetic. In the end he helps the gods of Law, but only to preserve the balance. For a final triumph of Law would be as disastrous as its opposite; balance between the two is the true good, and imbalance is evil. I think that in the original D &D worldview, Law and Chaos were external alignments, such as blue state vs. red state, Leninist vs. anarchist, that did not necessarily reflect the deepest tendencies in a creature’s heart. However, when D & D blossomed out of a dark and obscure subculture into mainstream acceptance, ’twas unavoidable to somehow integrate the good vs. evil trope that dominated fantasy literature, as well as Hollywood and all mainstream literature. Which led to Law vs. Chaos being treated as synonymous with good vs. evil. Which led punks, libertarians and anarchists to say, hey Gary Gygax, what about us? Thus, to accommodate the most people and make the most money, the two dimensional alignment system was born. But this adaptation of good vs. evil as a similar axis lacks not only the simplicity, but also the elegance, of Order and Chaos as external alignments and good in the heart. The diagram of astral realms in D & D suggests a two dimensional symmetrical multiverse. Thus, like Law and Chaos in Moorcock, now good and evil are in eternal balance, with “neutral” the natural state (as if the cosmos is a car), thus animals and druids are neutral. But balance is good; can there be a balance between balance and imbalance? The goal of “Wizards of the Coast” or whoever sells Dungeons and Dragons now, is still to create a platform that works for the broadest segment of people possible, which each dungeon master can adapt to their own values. The equation of Law (both in the sense of natural order and state control) and Good is pervasive not only in literature, but in all aspects of the spectacle around us; we tune it out to get through the day. For example, I watched a season and a half of “Twin Peaks,” a show popular with freaks, before I even noticed the only good (altruistic and caring) characters were in law enforcement. Thus we won’t convince them there is no Lawful Good any time soon.